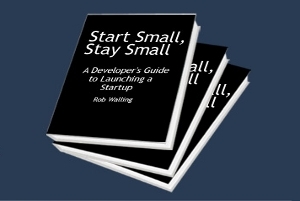 Start Small, Stay Small focuses on practical, step-by-step instructions used by hundreds of developers on the road to launching their startups. Whether you have a product idea or are still looking, this book takes you through the process of finding an idea, testing it, converting visitors to buyers, and attaining profitability as quickly as possible. The author, Rob Walling, is a serial entrepreneur with more than a dozen software products under his belt. A few of his successful applications include GetDrip.com (an email marketing app for startups and software companies), HitTail (a popular SEO keyword tool) and DotNetInvoice (the leading ASP.NET invoicing software on the market). Rob has been fortunate to be mentioned in The Wall Street Journal, Inc.com, Forbes.com, Investor's Business Daily, the D.C. Examiner, Entrepreneur.com, and many others. Rob blogs to 20,000 web entrepreneurs each month and co-host a highly rated startup podcast called Startups for the Rest of Us. ebook is available as an instant download. Available in PDF, ePub, Kindle (.prc) and mp3 formats, all as digital downloads. Ready to grab this ebook in various formats just for $14 today?